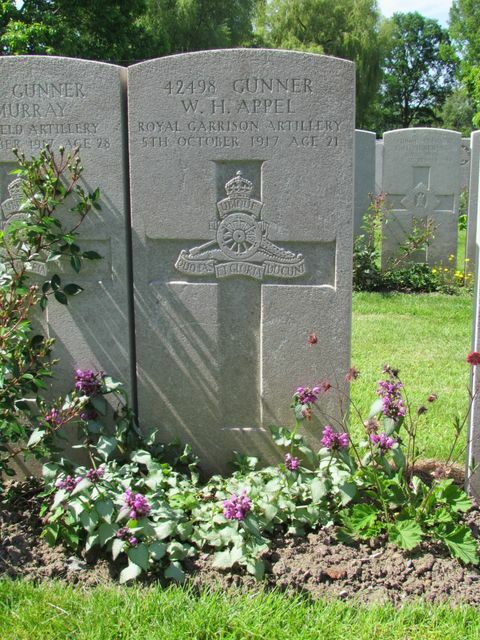 In Lijssenthoek Military Cemetery, West-Vlaanderen, Belgium. Grave location : XXV. C. 5A. Son of George Henry Appel and Emily Louisa Appel (née Sheaf), of Shanklin, Isle of Wight. Born : 1895, Cowes, Isle of Wight. 1901 : With his grandparents Aaron and Amelia Sheaf, at 3 Coppins Bridge, Newport, Isle of Wight. Aaron Sheaf is a Fisherman. 1911 : At the Church Army Labour House, Watling Street, aged 17. Occupation - Fish Monger. APPEL - Oct. 5, died of wounds, Gr. W.H. Appel, R.G.A., second son of G.H. Appel, East Cowes, (formerly of Newport), aged 22.